Chili & Cornbread Dinner at Pioneer Village and YOU are invited! Chili served with cornbread, cheese and onions! 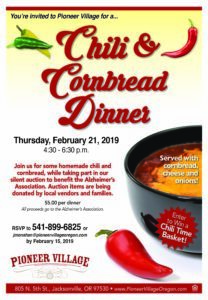 Join us for some homemade chili and cornbread, while taking part in our silent auction to benefit the Alzheimer’s Association. Auction items are being donated by local vendors and families. $5.00 per dinner – All proceeds go to the Alzheimer’s Association. Enter to Win a Chili Time Basket!